In an effort to support the revolutionary work being done in the field of cannabis-based medicine, I’ve compiled some of the most prominent information concerning the plant’s health benefits. It seems to have been created for the explicit purpose of helping the human body. Since the floodgates have been opened for extensive research into it (though not as extensive as if it were legalized worldwide), we in this era will be fortunate enough to learn almost everything it can do. More people than ever will learn about the ways it can heal the body, and a sea change in the way we see it will follow. Now, let’s focus on CBD; the increasingly well-known cannabinoid that boosts THC’s therapeutic effects and, as we’ll learn, lessens its side effects. There’s a tendency in our society to condemn things we know nothing about simply because we’re told they’re bad. This causes us to turn away from things like cannabis that could help us thrive, and until we break free from the herd mentality, it’ll continue to keep us from life-saving discoveries. Don’t accept what someone tells you; do the research and learn the truth for yourself, because you’ll encounter plenty of people who want to deceive you for personal gain. Don’t believe what I write about cannabis without a well-researched understanding of your own, because knowledge not only brings power, but independence. Read up on the subject and form your own understanding. You’ll quickly learn that this world is nothing like you think. All this surprising information will overwhelm you and send you on a quest to share the truth with others who are doing their research and sharing knowledge previously lost to history. This article appeared first at Culture of Awareness and appears here courtesy of Wes Annac. I’m a twenty-something writer & blogger with an interest in spirituality, revolution, music and the transformative creative force known as love. I runThe Culture of Awareness, a daily news blog dedicated to raising social and spiritual awareness and supporting the evolution of the planet. If you enjoyed this post and want to support my work, consider a donation (no PayPal account required). 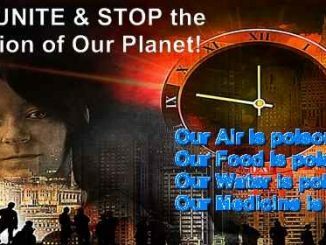 It is time to UNITE & STOP the Destruction of Our Planet!